How to Fix Download Pending Problem in Google Play Store? If you are downloading an app from the google play store and facing an app downloading error in Google Play Store or else you wish to fix downloading status in Google play. There are two easy methods to resolve download pending error in Google play store issue. If you want to fix this issue, you need to follow the step by step methods. Step 1: The first step is checking whether you have a working internet connection at all or not. If you don’t have one, switch on your internet connection and then restart your smart phone. This should fix the problem. Step 2: If it did not the second step is updating the latest date and time on your phone as this also causes an error sometimes. You can go to settings and manually change the dates. Step 3: If you still have the problem, then you would have to clear the app cache and data from the settings. Step 4: If this doesn’t work then the next step involves uninstalling and thereafter reinstalling the updates again of the Google Play store. Step 5: If it is still not working, next you would have to update the system as sometimes updates that are critical to a system operation are not downloaded and then the operating system of the mobile phone hangs. Step 6: If the above step doesn’t work, then you would have to enable the download manager. This can be done from the Application manager settings and then selecting the download manager and enabling it. Step 7: Lastly if none of the above steps work at all then check your device storage. If you do not have sufficient device storage which is less than 1 GB, then the apps would not be installed onto your device and you will get an app download error. Step 8: If above mentioned steps are not working, kindly visit Google play help forum to write your queries. 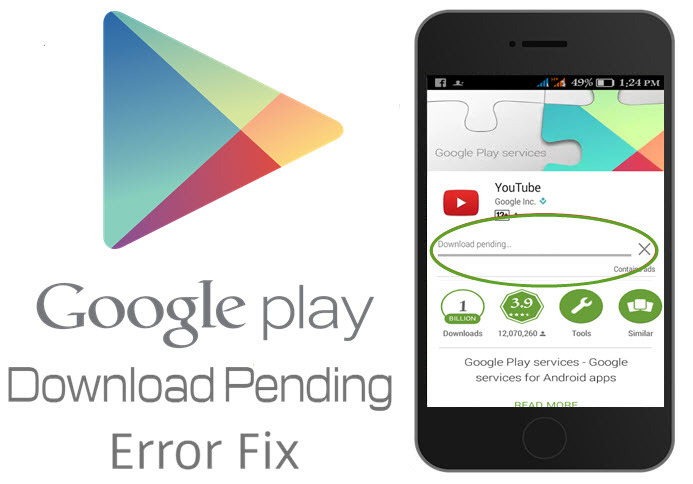 Method 2: How to Fix Download Pending Error in Google Play Store? Google play store is available for the android users to provide them the best stuff for their device and make it easy for them to get the access of different applications. Users can download any application of their choice and manage their work on their device. There are many applications available on the play store making it easy for the users to manage their work. On the play store, users will be able to get games, music, videos related apps making their device more exciting for them. There are uncountable apps available on the play store making it easy for them to keep their android device updated. But it sometimes happens that the users are not able to download any app on their phone. There appears to be a pending error in google play store causing trouble to them in their work. In such situation users need not to be worried as they can get the simple steps to fix their issue. These steps will help the users to make their work go smooth on the play store. They will be able to get the download pending problem in google play store resolved and continue their work easily on the play store to make it easy for them to get the applications easily. If users face any issue while working on the play store then they need not to be worried as they can easily contact the support team and interact with them their issues. The team of the experts will be available for the users to provide them the assured solution and make it easy for them to work on their device easily. After having an interaction with the team of experts, users will be able to resolve their issues and fix download pending error in play store allowing them to continue their work easily on it. Users can also go to the support page of the google play store where they will be able to get the assured solution for their issues related to play store and make it easy for them to continue their work on it. Post Your Comments in Below Comment Box and Get Suitable Solutions For Your Questions. I tried all of it nothing worked. I had to do a factory reset. The update sent to the watch seemed to beak a few things. Everything is running fine now.